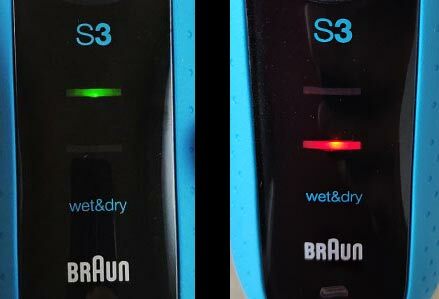 The New Braun Series 3 Electric Shavers: Which One Should You Buy? The Series 3 line has long been a favorite among electric shaving enthusiasts. The reasonable price, good performance and the inexpensive replacement parts, all backed by Braun’s notorious reliability, were the key ingredients for the product’s success. After several years of very strong sales, in 2015 Braun decided to revamp its line of entry-level shavers. 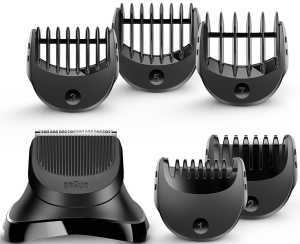 The new Series 3 family includes several variations, with razors suitable for wet & dry or dry only operation. 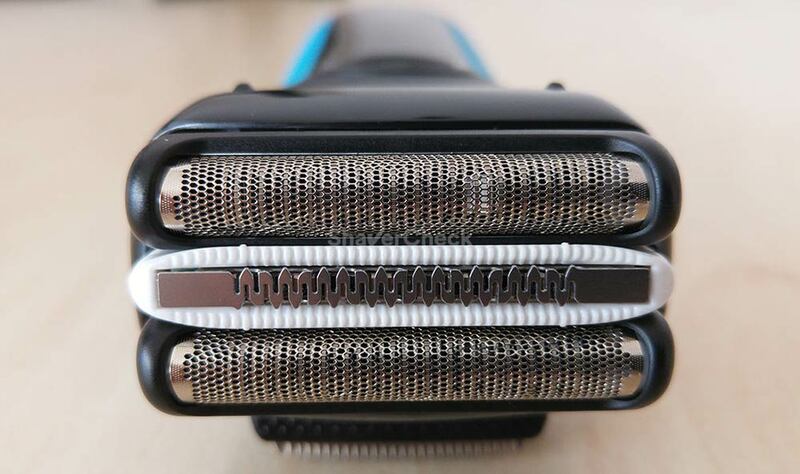 In order to differentiate the new razors from the old Series 3 line, Braun decided to use a simple, but effective name scheme by only adding a 0 after the 3. For example, the old Series 3 380s is now the 3080s. What are the differences between the old and new Series 3? The new Series 3 is more of an evolution than a revolution. Just like Apple does with its iPhones and iPads, Braun decided to incrementally improve and refine an already successful design. There’s not much to say about it as the new shavers use the same cutting system as the old ones: a typical setup of two outer foils for cutting stubble close to the skin and one middle trimmer that cuts longer hairs. The three cutters can move independently to easily follow the facial contours. As with all modern Braun razors, the blades and foils are integrated into a single piece called cassette and can’t be bought or replaced individually. The replacement parts are still the 32s (silver) or 32b (black) cassettes that now feature an updated white micro-comb around the trimmer. This element should catch and feed more hairs into the cutting parts. As we know from the older generation, these cassettes offer great value for money as they are inexpensive (at least when compared to similar shavers from Panasonic for example) and must be replaced only once every 18 months. They are also backward compatible with the old Series 3. The new shavers are available with several accent colors depending on the model, like blue, grey, red and even white. The design is sleeker and more refined, but again, nothing too radical. They are still instantly recognizable as Braun Series 3 razors. The wet & dry capable shavers are the 3080s, 3040s and the 3010s, while the ones suitable only for dry use are the 3090cc, 3070cc, 3050cc, 3020s and 3000s. Depending on where they’re being sold, the model names can be different than the ones mentioned above, but the shavers themselves are the same. After the launch, Braun also started to use the term ProSkin alongside the model names. 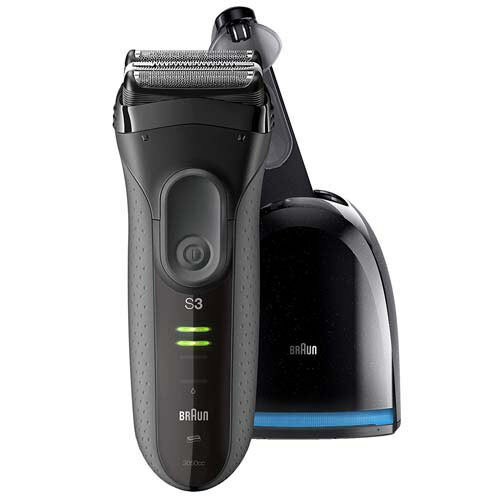 As a result, we have shavers like the Braun Series 3 ProSkin 3040s. 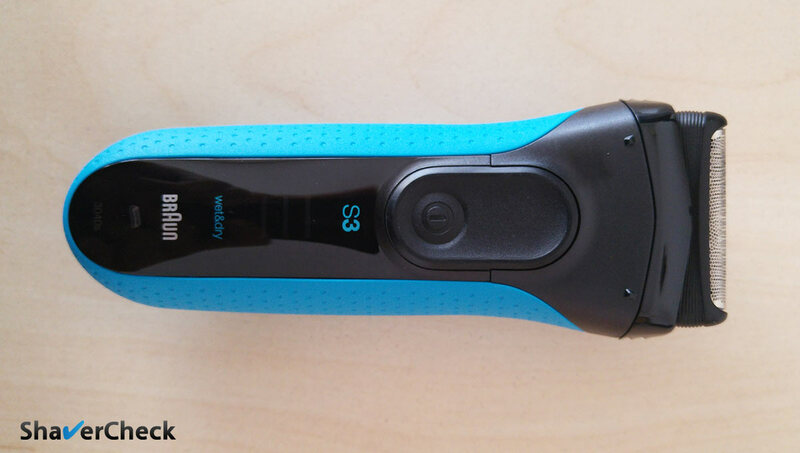 This particular shaver that we also reviewed is likely to become a best-seller as it’s reasonably priced and can be used both wet & dry. The ProSkin part can sometimes be left out and several online stores actually do this on their websites. However, they still refer to the same models. The cc in the name designates the razors that come with a cleaning and charging station, like the Series 3 3050cc. Speaking of which, the station seems to remain unchanged from the previous Series 3 generation and that’s not a bad thing at all as Braun’s alcohol-based cleaning solution works excellent. The Series 3 ProSkin 3050cc is one of the models that include the cleaning base and again, it looks like the top pick from the bunch as it usually costs less than the others (3070cc, 3090cc). For more details you can also check out our full review of the 3050cc. You can see all the differences between the refreshed Series 3 models in the table below. 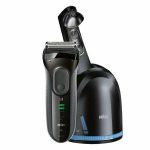 The dry only models can be used both cordless and while charging, with the supplied cord plugged directly into the shaver. The wet & dry variations can only be operated cordless as a safety precaution. A very interesting addition to the Series 3 is a set of compatible accessories designed specifically for men that maintain a beard. Precisely, we have a trimmer attachment that looks very similar to a regular facial trimmer and can be used to trim your entire beard. You simply pop out the regular cassette and insert the trimmer in its place. There are also 5 combs with different lengths (1 to 7 mm). 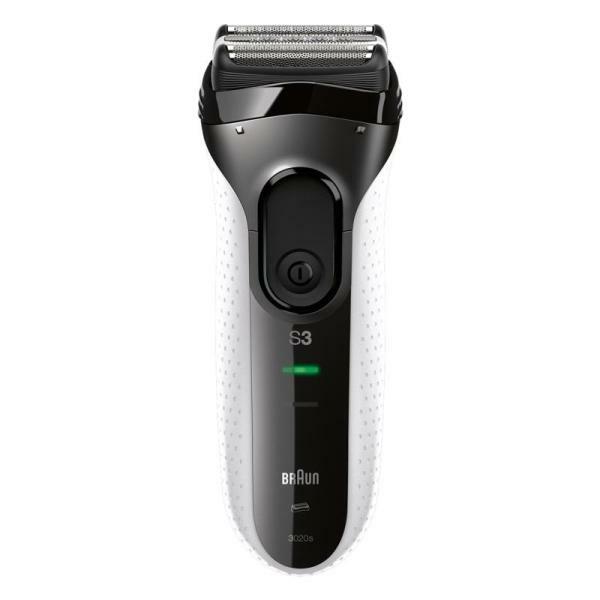 You can buy the trimmer attachment separately and use it with your existing Series 3 or you can buy it as a package with the shaver included (for example, the Braun Series 3 3010BT Shave & Style is such a model). Should you buy the new Series 3? Well, that really depends; if you are currently using the older Series 3 then probably not. There aren’t any significant differences to justify purchasing the new shaver. If you plan on buying a Series 3 for the first time, the updated models can be found at even lower prices than the corresponding old ones. If that’s the case, definitely go for the new one. If it’s the other way around, just buy the similar older model. The actual shaving performance will be the same. 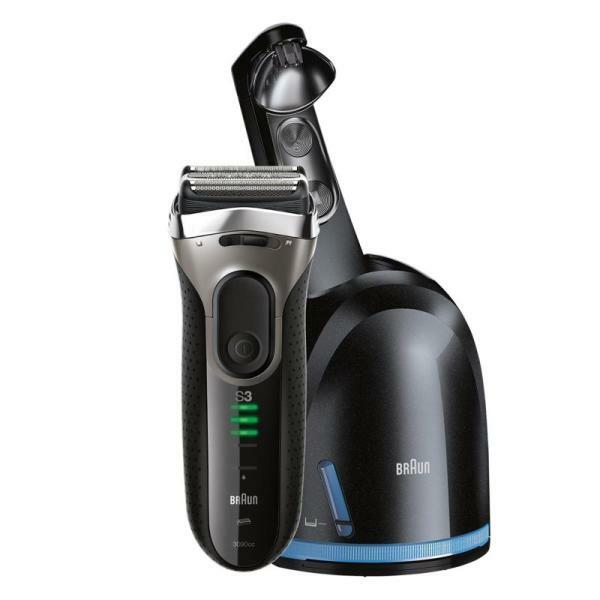 Another quick buying tip: if you’re only going to use it for dry shaving, consider one that includes the Clean & Charge System, like the 3050cc. If you can get it at a discount, that’s even better. Also, the integrated long-hair trimmer is quite good and useful, so I would also skip the models that don’t have one, like the 3010s. So in a 3010 vs 3040 situation, the 3040 makes more sense as it costs only a fraction more and includes a trimmer. Other than that the two are identical. 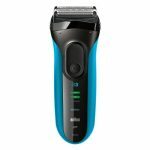 Overall, the new Series 3 is a welcome revamp of an already excellent line of shavers; while it doesn’t bring any major improvements, it will most likely help Braun maintain its strong position in the entry-level category of electric razors. Home » Articles & Guides » General » The New Braun Series 3 Electric Shavers: Which One Should You Buy? What is the difference between the Series 3 3040s, and the 3040? Thanks! Hi Alan, it’s actually the same shaver. 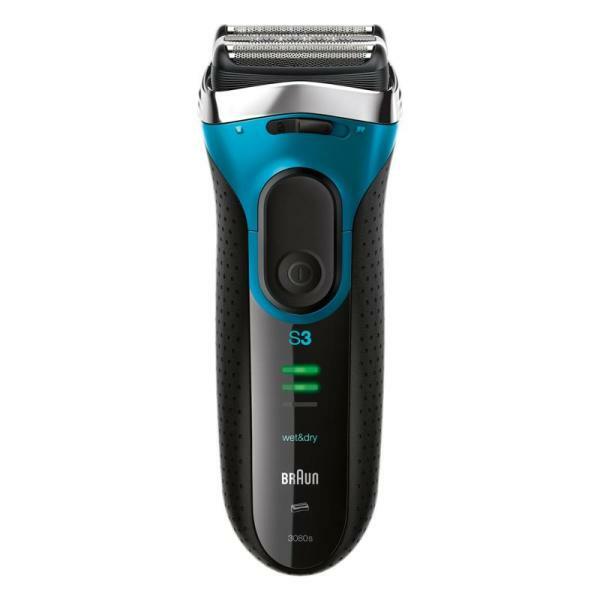 The model name is 3040s, but it’s sometimes referred to without the s.
The Series 3 3010s doesn’t have a long hair trimmer. is it good ? and what is the different between 3030s &3040s ?? what is the maximum hair length it can shave ?? The 3030s is suitable for dry shaving only. The shaving performance between the two is identical. The Series 3 works best when used on short facial hair – I would say below 2.5 mm. The 3090cc is a dry only model. Actually all the Series 3 shavers that include the cleaning station — the cc models — are suitable for dry only operation. A new column to show if corded/cordless. Thank you for your comment. I added an additional explanation below the table. The 3045s is identical to the 3040s, but as far as I know it is sold only in Europe. Can I use the Braun 3 directly of the mains power? the dry only models can be used while connected to the mains. The wet & dry ones cannot due to safety concerns. You can find all the dry only Series 3 models in the table above. Which is a better buy, 3040s or 3010BT? That depends on what you need from an electric razor. If you maintain a beard or goatee, the 3010BT would be the one to have. Otherwise you can go for the 3040s and use its hair trimmer for minor touchups. The shaving performance of both is identical and they use the same shaving heads. Hello Ovidiu, thanks a lot for your review it helps me a lot. Now the only question is which shaving head suits for the 3010BT and which for the 3040S? The same replacement works for both? And which model of replacement would be? Ok….I’ve already read the whole article, then another comparisson. What are the differences between the 310S vs the 3010S? 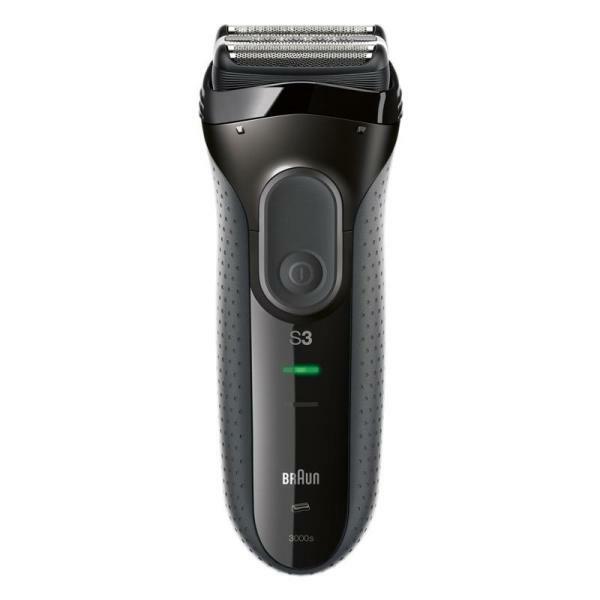 Both the 3010BT and the 3040s use the same shaving head (32b). The shaving heads of the two models mentioned by you are identical and yes, you can certainly use the beard attachment with the 3080.
do you know the difference between 3020s and 3030s beside the color? Also what is the precision lock? The color is basically the only difference between them; both come with a hair trimmer and a protective cap. The precision lock is just a switch that locks the blades into place and it’s only present on certain Series 3 models (please see the table in the article). Neither the 3020s or the 3030s has it, but it doesn’t really matter. Hello can you use the accessories from 3010BT ( different trimming size heads) for the 3040s, or 3030s, 3020s, etc? Absolutely, they are compatible with the models you mentioned. I have a 3050cc which will no longer work…If I purchase a 3040, can I still use the cleaning and charging station that came with the 3050 for the 3040? Thanks. Sorry to hear that. Unfortunately the answer is no, the 3040 won’t work with a cleaning station. Only the cc models that originally came with a cleaning station will work with one. What is the difference between the 310s and the 3040s, other than $30? Thank you! The 310s has a much smaller battery than the 3040s (20 minutes of shaving time vs 45). Also, the 310s lacks the hair trimmer. Thank you for your reply and thorough reviews! 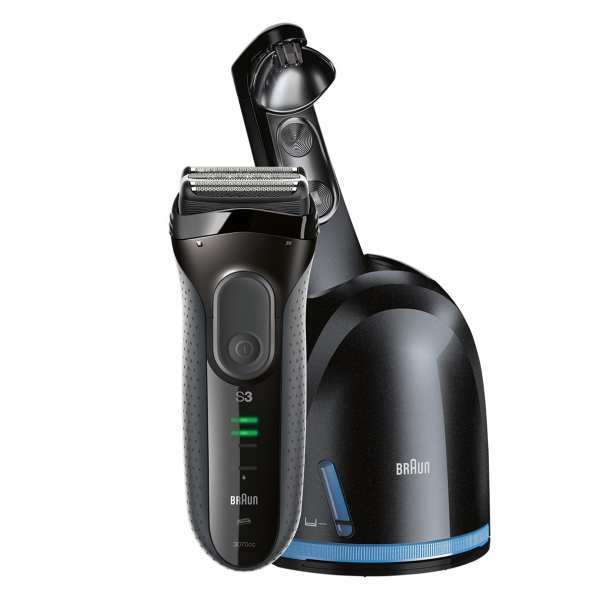 Thanks for the informative review of the Braun 3 Series shavers. It’s refreshing to find an unbiased review that’s not a “paid advertisement”. I purchased the 3010BT to replace my old Braun 7526 that recently died and a cheap off brand beard trimmer. While the 7526 was an excellent shaver, I am not a fan of the cleaner cartridges. They work well put are not very cost effective. Looking forward to see how well this unit works and how easy it is to clean. Hello, hope you may help me. Is 3045s compatible with an cleaning and charging station? I’ve had it for several years now, but lost the shaver during the travel. So before buying 3045s trying to figure it out. The station i have looks identical for the one in the picture (The Braun Series 3 3050cc). Unfortunately no, the 3045s won’t work with a cleaning station. Are there 3 series models compatible with it? Thank you in advance, Ovidiu! Only the cc models that originally came with a cleaning station (like the 3050cc, 3090cc and so on) will be compatible with the cleaning station. So unfortunately you cannot buy a solo model like the 3040s for example as it will not work with a cleaning station. Why? Isn’t the head and charge adapter the same? The Series 3 solo models lack the electronics needed to communicate with the station. The Series 7 is the only one that will work with a compatible cleaning & charging station. I have a 320 S4 what is the difference with all the other shavers and its only dry I believe? The 320-s4 is part of the previous generation and yes, it’s suitable for dry only use. However, in terms of features and performance it’s very similar to the new Series 3 models. It uses the same foils and blades and it’s also fitted with a long hair trimmer. If you can find it at a better price than let’s say a 3040s, then by all means go for it. As I said, the actual shaving performance will be the same. Could you please tell me whythw 3040s cannot be used with the cleaning station which will happily clean 3050, 3070 and 3090 ? Unlike the 3050cc, 3070cc and 3090cc, the 3040s lacks the electronics needed to communicate with the station. This is the case with all Braun s (solo) models except for the Series 7. The Series 7 solo shavers will work with a compatible cleaning station, while the Series 3, 5 and 9 will not. Thanks for your detailed review, yet I have a question. what is the difference between 3040s and 3020s? I know 3040s is Wet&Dry and 3020s is Dry only. (if understand correctly they both have the same performance and use the same shaving head). So can I use 3020s as Wet&Dry? how 3040s technically different from 3020s to operate Wet&Dry. Thank you for your comment. Both the 3040s and 3020s are IPX7 certified, so you can submerge them in water without any problems. 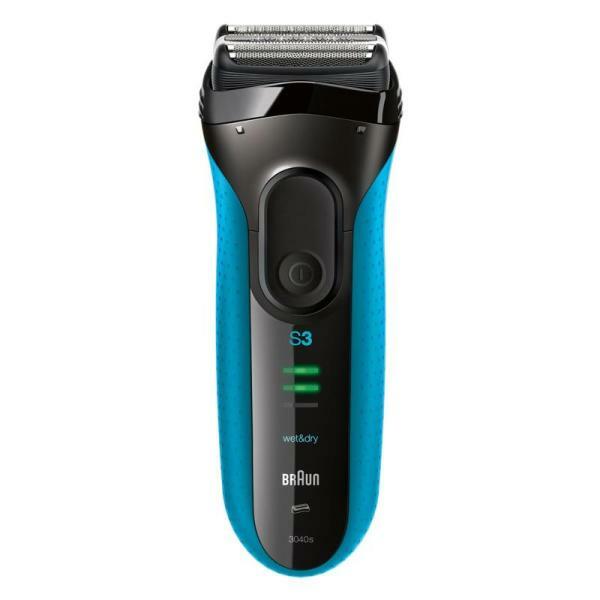 However, the 3040s is explicitly marketed as a wet & dry shaver since it won’t work while charging (as a safety precaution). The 3020s does work when it’s connected to an outlet, so that would be a serious risk if someone where to use it like that in the shower for example. 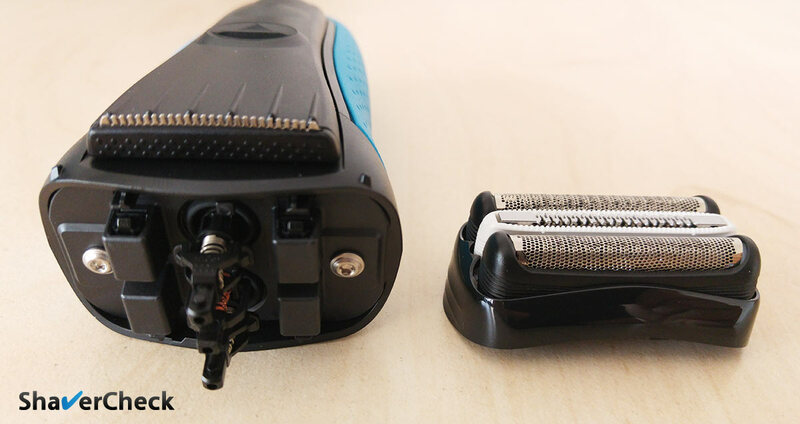 The performance of the two shavers is indeed identical and they also use the same shaving head. Thanks Ovidiu for your reply. 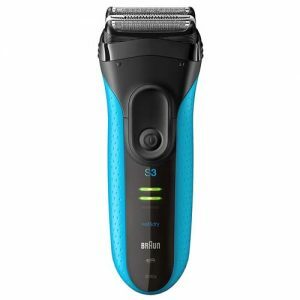 So, can I use 3020s, and 3030s as wet (with gel) [as long as I discorded them – as a safety precaution] without any damage to the shaver or degrading in the performance? You are welcome, Mark. While I cannot explicitly recommend it (for obvious reasons), there are many users that have successfully used them in that manner, with absolutely no damage to the shavers. Just make sure to clean your Series 3 after every use and also lubricate it regularly (clipper oil, sewing machine oil or a lubricating spray like Remington Shaver Saver will work great). 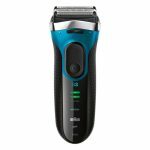 I am new to using electronic shaver and would like to buy a good shaver to get rid of the stubble without hurting my chin. 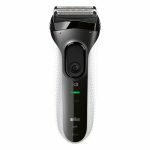 Which model is the best shaver that is good and long lasting? Thank you for your comment. If you’re only referring to the Series 3, the 3040s is usually the best option (in terms of price and features). Otherwise, there are many factors to take into account when looking for a shaver that is suitable for you and you alone. I highly recommend you to check out this article as I cover the topic in great deal and also make quite a few shaver recommendations. hi dude , you doing great job ! educating people .. could you just help me about which brauns trimmer gives best and closest shave , budget under 100$ , india ! Thank you for your comment. I am not familiar with Braun’s prices in India, but you may be able to grab a Series 5 for under $100. That’s definitely the best Braun shaver you can get in that price range. Try to look for a solo model (that doesn’t come with a cleaning station), they are always cheaper than the cc models. I have an old Braun 5 series, and just bought the 3020S to use while travelling. I’m dismayed, however, to find that I cannot separate the cutter head from the blades, so I can only clean them with running water. This seems to me to be a retrograde step, probably to ensure users have to buy the whole assembly at a greater price. My question is how best to clean the blades and foil. Hot water seems a poor way of doing that, and direct application of an alcohol cleaner is better than just spraying into the head. Also, do you recommend running the shaver while dousing it in hot water to clean it. Where exactly does one insert the drop of oil? 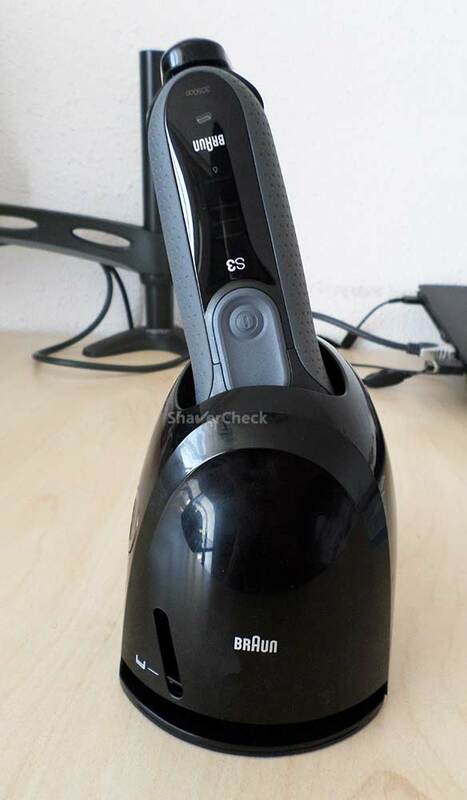 Should the oil be used while the shaver is running? Is the old Braun 5 series more powerful and efficient than the new 3020 series? Thank you for your comment. All current Braun shavers (except for their travel shavers) use these so-called cassettes that have the blades and foils merged into a single piece. This does make a manual cleaning more difficult, but on the Series 3 is not nearly as bad compared to the current Series 5, 7 or 9. I’ve found that the best way to clean them is to use a bit of liquid soap and warm tap water. After completing your shave, remove the cassette and gently tap the plastic frame on the sink to get rid of the bulk of hair strands. Put it back on the shaver, add a bit of water and few drops of liquid soap on the foils, then turn the shaver on and let it run for around 15 seconds. You can add a few drops of water if needed so the soap can lather nicely. Rinse the shaving head under warm tap water (with the shaver still running). After that, turn the razor off, remove the cassette, rinse it thoroughly (both the outside and the inner part). Rinse the shaver’s body as well, shake off the water and gently pat the parts with a towel and let them air dry completely. As for the lubrication, I would do it after every cleaning that involves the use of soap. You must place a single drop of oil on the outside of each cutting element (in the case of the Series 3, two foils and one middle trimmer). Let the shaver run for a few seconds so the oil can coat the blades evenly, then pat the foils gently with a paper tissue to absorb any excess oil. I haven’t got the chance to test the older Series 5 unfortunately, so I cannot compare it directly to the Series 3. The current Series 5 is a superior shaver though, it feels more powerful and faster and also gets flat hairs a lot more efficiently. Question.. first I no longer have the original instructions. I’ve been satisfactorily using my Series 3 Braun for quite a few years. I do complain the head could perform longer than two to three months before needing replacement. I’m writing because the small AMBER light is now lit but I don’t know why. I’m familiar with the charging green light. What does the yellow light indicate? I don’t recall seing this light glowing. What should I be doing about it. Is it the low-charge light in this picture? If not, you may be referring to the replacement light that comes on after at least 18 months. You can press and hold the power switch for at least 5 seconds to reset it. I have not read comments about BRAUN 300S. I was comparing that model Vs 3020, and I think the only different is that 3020 has a popup trimmer, isn´t it? BTW, I want to use to it to shave my head, I guess these shavers are also suitable to do it. Yes, that’s the main difference. The 3020 also comes with the 32b shaving head that has different foil hole pattern compared to the older 21b on the 300s. But the differences between them are not major. You can use a Series 3 for shaving your head as well.